So we've been trying some new-fangled pizza creations over the last few weeks. I was in the mood for a good ole fashioned pepperoni pizza. I'm sure you all have your favorite way of making it. But if you haven't viewed my VLOG about making homemade pizza dough, you might have missed my shopping tip. Next time you are at the grocery store, stop by the deli counter to see if they carry the large sandwich size pepperoni. If they do, have them slice you about 20 slices. That's enough for two large pizzas. Mine usually cost anywhere from $1.25- $1.85 depending on the thickness. Remember the price per pound is going to be pretty high, as much as $8.99 for Boar's Head. But when you are only buying a few ounces, you can splurge and get the good stuff and still not break the bank. Prepare the pizza dough as directed. Spread sauce within 1" of edge of dough. Sprinkle mozzarella cheese over the sauce. Layer pepperoni slices over the cheese and then sprinkle a little more cheese over pepperoni, finally shaking a little Parmesan cheese over the top. Bake as directed. When it comes out of the oven, sprinkle with Italian seasoning and enjoy! 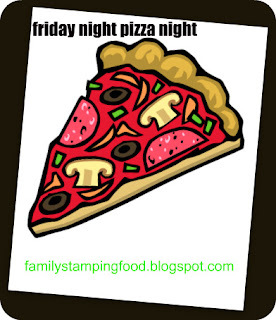 I hope y'all have a great Friday Night Pizza Night, and have a great weekend with your family!